Posted: Sun Oct 05, 2008 1:49 pm Post subject: What do you think? here's a pic a friend took a while back, have a look and see what you make of it. The immediate thing was that the drawer appeared to be levitating, though this wasn't 100% and needed the larger picture too. This is just a cropping of the piece I found of interest. Based just on this cropped pic alone, One could argue that the drawer is just sticking out of an unseen dresser. 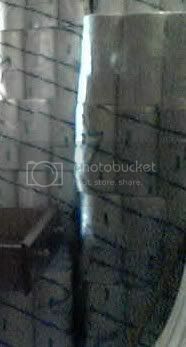 There is "what appears" to be a disembodied face near the top of the stack looking down at the drawer. I would make the call that this face being a spirit is inconclusive. I really wish I still had the original picture. The drawer was always inconclusive. The face, however, wasn't noticed at first, but in the full size pic and with a bit of light altering, was quite interesting.